Claus Föttinger was born in 1960 in Nuremberg and lives and works in Düsseldorf and Seddulbahir, Turkey. He received his first insights into stage sets and painting at the Municipal Theatre in Nuremberg and has worked for two advertising and object photographers as an assistant. At the Düsseldorf Art Academy, he studied Free Painting and concluded his studies as a master student with Professor Alfonso Hüppi in 1989. In his work, he focuses on object and installation art. His subject is dealing with political and cultural history and the present. Giving the memories and biographical situation a tangible and aesthetically appropriate form is the most important part of his work. The “social sculpture” influenced by Joseph Beuys is the basic idea behind his experimental arrangements, which he has designated for more than 30 years with the generic term “Bar”. He has created these “Bars” with photo backgrounds, covered and stitched objects from the area of the interior and lighting which he considers as socially relevant, often also with parts of older work by him which are always newly adapted to the new conditions. The “Bar” works as a microcosm and simulation space for socially current processes or attempts, on a subcutaneous level, to draw out forgotten, hidden events in history for the current discourse and make them usable. Claus Föttinger was represented at the group exhibition “Come in” of the IFA institute with the work “Hermann’s Döner Inn”, and the exhibition toured 4 continents from 2001 to 2016. In 2004 he was invited by the Fritz Bauer Institute to participate in the exhibition “Ausschwitz – Prozess 4 Ks 2/63” with the work “Club BRD” and designed and built the World Cup bar in 2014 for the German national soccer team in Campo Bahia, Brazil. Christoph Schlingensief and his work have accompanied me since the late 1980s. Talk 2000, the U 3000 and Ausländer raus are important reference models for my own work. In a similar manner to René Pollesch, his themes and their implementation always touched me deeply. The struggle for political, somehow moral relevance of one’s own existence, the fight with one’s own biography in post-war Germany and the consequences of reunification, globalisation and the development of a common democratic Europe are the topics of our generation. His step in founding the Opera Village fascinated me the first time I heard about it. The desire to make something else, positive and useful, out of the temporary despair at the conditions with his talent, to think of something like a Utopia – a goal that we knew from our youth, books and films and that was sometimes completely wiped out by so many setbacks. Beautiful failure, even such a great concept from him. After two weeks at the Opera Village, I can say that I have seen few projects that make sense as much as the Opera Village. The Opera Village as a utopia and a social sculpture, society as a real performance. Since the death of Christoph Schlingensief, Aino Laberenz has done a fantastic job together with many others and commemorated his memory in an admirable way for us. The prospects that have been created for the children with the school and for the mothers with the health clinic will change the course of the biographies of these students and women. Those providing assistance are also being helped, by being able to find and locate the purpose of their existence once again. The architecture of Francis Kéré, specially created for this location, does the rest and completes the Utopia for the moment. It would be nice if I could make a small contribution with my work to this great project too. Mouhamadou Moustapha Diop studied Visual Arts at the l’Ecole Nationale des Arts (ENA) in Dakar, Senegal, where he completed his studies in 2015 as valedictorian. He essentially works as a plastic artist, who has also developed in the art video and experimental film sector as director of animation. He is inspired in his artistic approach by urban scenes, which he associates with daily images. To do this, he focuses the abstract concepts on the simplicity of things and on elementary communication ideas. Mouhamadou Moustapha Diop broadened his work in the field of communicative research and images and representations with the aid of video animation using various techniques, such as stop-motion, designs and puppets or dolls. Since 2010, he has held regular exhibitions in Paris and Dakar. In 2012 and 2016, his art was exhibited in the supporting programme of the largest contemporary art biennial in Africa, Dak’Art. It is my pleasure to be artist in residence in collaboration with OPERA VILLAGE AFRICA and the Goethe-Institut in Burkina Faso. This has allowed me first of all to discover a different country to my own, to meet other people, other cultures, in short, I have discovered another environment. Being artist in residence has also offered me high range of expression throughout the Opera Village, in a magnificent place within a natural environment, which has inspired me very much. Being artist in residence here is an interesting twist in my professional career as plastic artist and videomaker and I hope that this will bring new visibility to my work. Long live the initiative of the OPERA VILLAGE AFRICA and long live the arts! Jeannette Mohr (*born 1961 in Nuremberg, lives in San Diego, California and Düsseldorf) studied theatre, German literature, art history and philosophy in San Diego, Berlin and Erlangen. During and after her studies she worked as a dramaturg and a director at the Oldenburg State Theatre. She then worked as a writer and producer in film and television. Since 1992 she has lived with interruptions in the United States and taught at the UCSD (University of California San Diego) in the fields of linguistics and literature up to mid-2017. In the gallery of Kerstin Engholm in Vienna, March 2017, she and Claus Föttinger presented the results of a digital artistic exchange. Located within the context of their biographies, photos, memories and stories were exchanged for a few months in a digital setting. They reacted to and with each other and thus created new layers of references. In “bubbles carry a lot of weight”, she and Föttinger offered an experimental arrangement in which, between Mexico and Gallipoli, San Diego and Düsseldorf, affects were produced and experienced, conditions of emotions and knowledge accumulated and new contexts and correlations established. 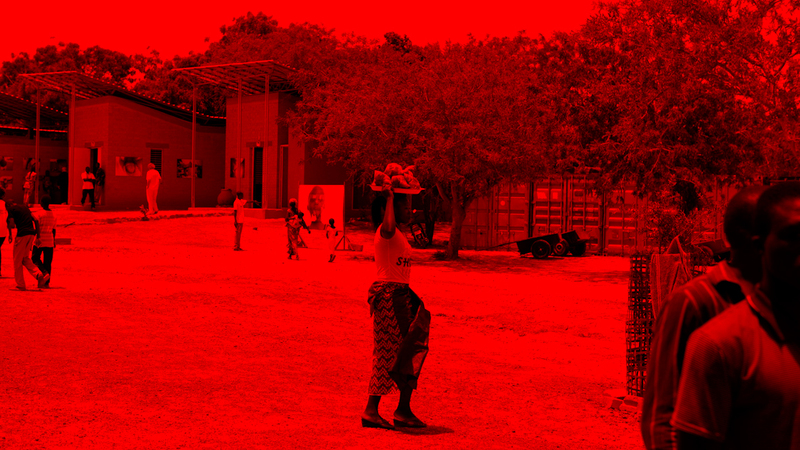 To me, the Opera Village in Burkina Faso seems an utopian idea that manifests itself in reality. I am especially impressed by the school that has existed there for many years. Children are immediate and direct and – given the opportunity of a fear-free space – can develop into creative tightrope artists. Sharing information and getting to know each other, testing images that we have of each other, checking how they measure up against reality and eventually throwing them out – that is what I’d love to do there. As in the previous months Claus Föttinger and I will try to substantiate our experiences, pushing them and driving them forward. In exchange and discussion with the people in the Opera Village Africa, we want to add something new at a social site, beyond school, beyond opera house and beyond museum. The Artist-in-Residence of the year 2017 was realised with the kind support of Goethe-Institut Ouagadougou and Operndorf Afrika Foundation.